WARWICK, RI – ATW Companies Inc., a leading provider of custom manufactured metal components and services, will be highlighting its leadership in engineered metal solutions for medical devices at the MDM West Exposition, Booth #3154, February 10-12, 2015 at the Anaheim Convention Center in Anaheim, California. On display will be prototypes of unique suturing devices made using metal injection molding (MIM), manual surgical instruments for surgeon interactive technology, and an award-winning mechanical introducer device for obstetrical/gynecological surgery. ATW will also highlight its medical machining capabilities, which facilitate high volume manufacturing processes, as well as medical stamping and assembly capabilities, which make it a one stop problem solver for medical device manufacturers. On display at the show will be prototypes of unique new orthopedic curved needle suturing devices, featuring several small and intricate moving parts made using MIM at ATW's MIM facilities in Rhode Island and California. 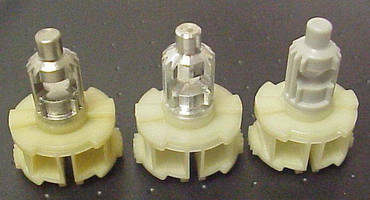 These intricate devices will be combined with tube cannulas made at their tube fabrication facility in Pennsylvania. Also to be exhibited will be a mechanical introducer device used in minimally invasive obstetrical/gynecological surgery, for which ATW's Parmatech subsidiary was awarded the grand prize in the medical/dental category of the 2012 Powder Metallurgy Design Excellence Awards Competition, sponsored by the Metal Powder Industries Federation (MPIF). Using the metal injection molding (MIM) process provided a 70 percent cost savings over equivalent machined parts. Representatives from the ATW Companies will also be on hand to discuss its capabilities for using machining in developing high volume manufacturing processes like MIM. The company's machining division is especially ideal for new product development when there are expectations that the product line will eventually require the efficiencies and cost savings of a high volume process. In addition, ATW's complete assembly capabilities means the company can serve as one-stop problem solvers, increasing its value proposition to customers. Headquartered in Warwick, RI, ATW Companies is a provider of highly engineered metal solutions to the metal component marketplace, servicing customers worldwide. The company runs state-of-the-art manufacturing facilities located in California, Pennsylvania, and Rhode Island and offers global sales and support. ATW provides a wide range of fabrication technologies to meet the exacting requirements of industries and diverse technologies for the most critical applications. The company's motto is "Be the Best…Do it Right," and they strive to live by this commitment to quality, reliability, innovation, and integrity by continuously adding value to their products and services.